CarGurus has 1,230 nationwide MKT listings starting at $3,200. Those in the market for a luxury-oriented full-size wagon could do worse than the 2015 Lincoln MKT. Unfortunately, they could do better, as well. With a profile that reminds some media folks of a hearse, looks won’t win this under-achieving Lincoln any prizes, but this posh people hauler does seat 7 folks in 3 rows, boasts a boatload of creature comforts, and can be delivered in an all-wheel-drive (AWD) variation that boasts a turbocharged V6 powerplant. A pair of trims—the base 3.7L and the abovementioned up-powered 3.7L EcoBoost AWD—once again grace the MKT lineup for the upcoming model year. No significant changes are stated for 2015, but Lincoln is upgrading its available complimentary Sync-interfaced GPS navigation and satellite-radio-based Travel Link from 3 years to 6 years on all of its other products, thus there’s no reason to believe said upgrade won’t be offered in the MKT. Although a number of reviewers have stated (some for a couple of years now) that the MKT, which shares its platform with the boxy Ford Flex, is destined solely for fleet sales, this distinctive hefty hauler is hanging tough in dealer showrooms. Consider, however, that Ford’s popular Taurus sedan has, by itself, outsold all 5 Lincoln products combined. In any case, the base 2015 MKT 3.7L returns in front-wheel-drive (FWD) configuration only and sports a 3.7-liter V6 powerplant that mates with the standard 6-speed shiftable automatic transmission (with steering-wheel-mounted paddle shifters) to put out 303 hp and 278 lb-ft of torque. Look for EPA-estimated mileage to run 17 mpg city/25 highway. Move up to the MKT 3.7L EcoBoost AWD and you get standard intelligent AWD plus a twin-turbocharged variation of the 3.7-liter V6. Again managed by the 6-speed shiftable automatic with the steering-wheel-mounted paddle shifters, this forced-air 6-banger throws down 365 hp and 350 lb-ft of torque to the tune of 16/23. Oh, and expect a maximum towing capacity of 4,500 pounds with the proper equipment. By the way, Lincoln is toying with the idea of a 9-speed auto-manual transmission for a number of its sedan offerings for the 2016 model year. Whether this upgraded shifter will make it into more utilitarian offerings, including the MKT wagon, remains a matter of conjecture. Moving on, standard bling in the 2015 MKT trims remains typically high-end, with both iterations boasting such appearance goodies as 19-inch alloy wheels, fixed moonroofs in front and rear, a power liftgate and a rear spoiler. Inside, look for the return of standard premium leather upholstery, heated power-adjustable front seats, full power accessories, memory for driver's settings, cruise control and power-adjustable telescoping tilt-wheel steering. Tri-zone auto climate control also remains standard, as does a rear-view camera, an auto-dimming rear-view mirror and rear parking sensors. Techno-goodies, meantime, include Bluetooth-integrated Sync infotainment, interfaced with MyFord Touch voice and touchscreen activation for destination downloads and mobile WiFi capability, as well as a CD player with 10 speakers, satellite radio, a video monitor, and a memory-card slot. Options include a power sunroof (Vista Roof), a refrigerated rear storage console, second-row bucket seats (6-passenger capacity), a power-folding third-row seat, power-adjustable pedals, a heated steering wheel, GPS navigation (with Travel Link), and a THX II premium audio upgrade boasting 14 speakers and 700 watts. Standard safety equipment adorning the 2015 MKT includes 4-wheel antilock brakes (ABS), front side-mounted airbags, 3-row head airbags, front fog/driving lights, turn-signal-integrated mirrors, Sync emergency telematics, and a post-collision safety system. Ford’s touted MyKey programmable speed and audio limiting is also standard for those times when the kids borrow the car, while a standard remote antitheft alarm provides some added security. Optional safety stuff, meantime, includes blind-spot warnings (BLIS), lane-keeping assist, active parallel parking assistance and adaptive cruise control with forward collision alerts. 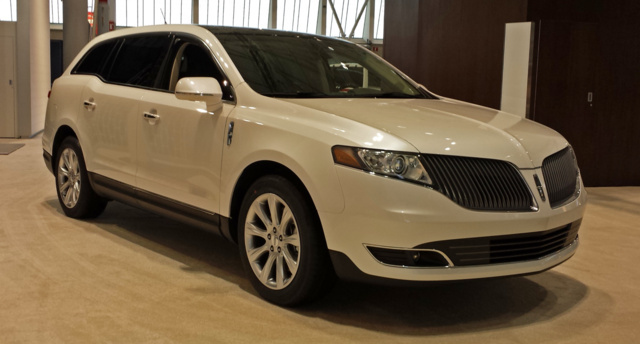 What's your take on the 2015 Lincoln MKT? Steve I'm in the process of buying my 2nd MKT. They are light years ahead of other suv type's and people have let the first impression of the polarizing exterior stop them from buying one of the best cars out there. wayneatmlcs I just bought my 2nd MKT. Car looks impressive and I get lots of compliments on it. Buy one and you'll never go back to whatever piece of junk it is that you drive! Have you driven a 2015 Lincoln MKT? What is the best (opinion) oil to use in a Lincoln MKT without Turbos?